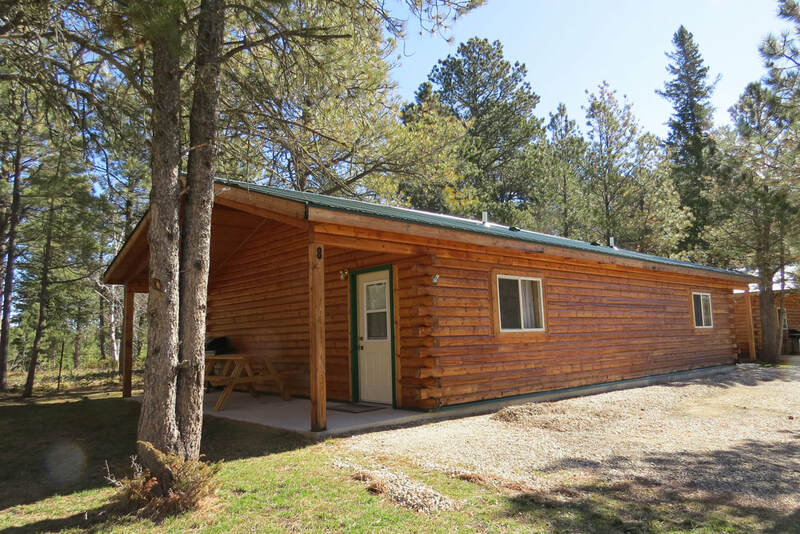 5The cabins and campsites at Mystic Hills Hideaway offer a unique opportunity to be surrounded by the Black Hills National Forest and to have immediate access to the ATV / UTV and snowmobile trails. 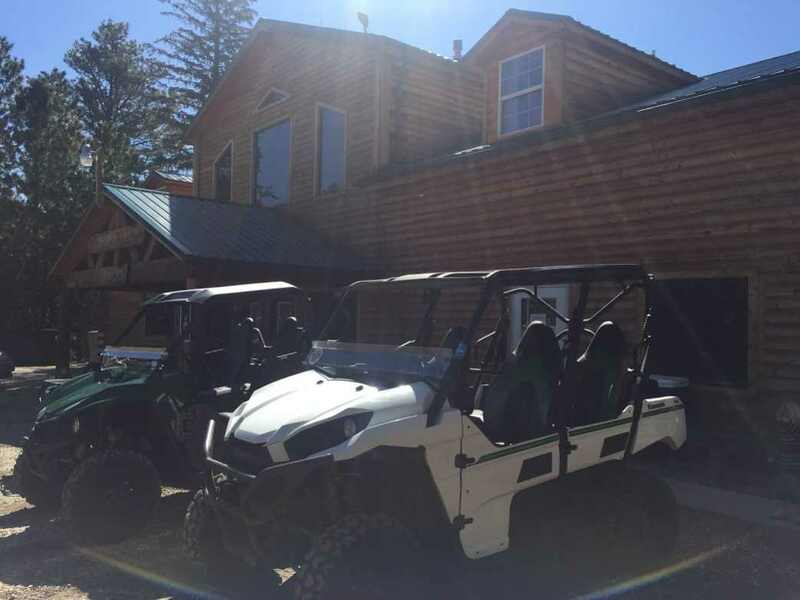 We are a premier destination for OHV trail riding and we welcome you to stay with us and explore over 500 miles of ATV trails and 350 miles of groomed snowmobile trails accessible from our backyard. We provide linens, towels, pillows and comforters in all cabins and rental units. Each unit has an outdoor charcoal grill, a picnic table, and fire ring. The Lodge Rooms and the Tree House have outdoor tables and chairs on the deck. Each kitchen is stocked with basic cookware, dishes, silverware, and utensils in addition to a dorm-size refrigerator, microwave, electric skillet, hot plate, toaster, and coffee maker (coffee included). The Lodge Rooms and the camper rentals have full size kitchens with stoves. 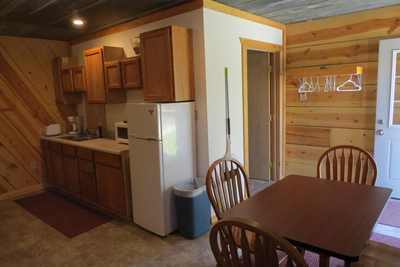 Cabins 1 through 9 now have air conditioning as well as all of our other rental units . No internet is provided and only those with AT&T will have cell phone service. Laundry is available in the lodge. Summer 2020 reservations will be accepted starting on January 15 at 8 AM Mountain Time. We hope you enjoy your stay with us. Feel free to call us at 605-584-4794 if you have any questions. 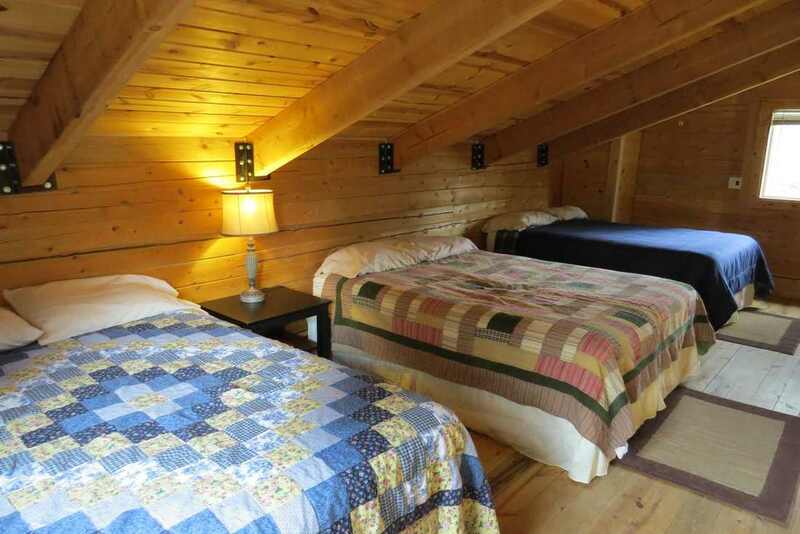 Our largest cabin loft-style Cabin 9 has three queen beds and a queen-size sofa sleeper. It sleeps a maximum of 8 guests. One bathroom, a dining area, AC, kitchenette, TV with basic cable, and an outdoor 6- person hot tub. 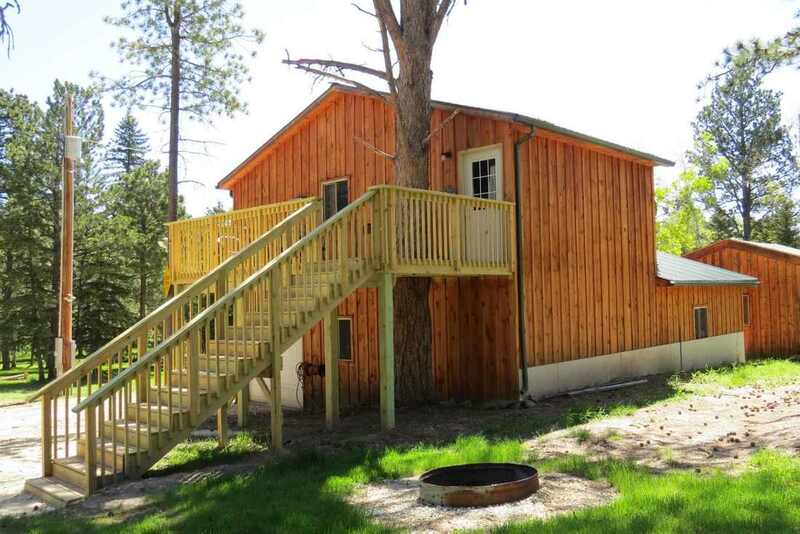 It's nestled at the end of the row of cabins with views of the forest and the campground. Additional Guest Info: Rate is for 6 adult guests with each additional adult at $15 extra per night with up to 8 maximum guests allowed. A $25 non-refundable payment required at time of booking and the balance paid at check in. If cancelled at anytime, the $25 deposit serves as your cancellation fee. If cancelled five days or less prior to check in, charged for the full cost of the stay unless we can re-book. Children under 11 years of age are free. Pets are $10 extra per pet per night. Sturgis Rally Week Info: Rate is for 6 adult guests with each additional adult at $30 extra per night with up to 8 maximum guests allowed. Full payment required at time of booking. Subject to a $100 Cancellation Fee and non refundable 60 days prior to check in. Pets are $10 extra per pet per night. 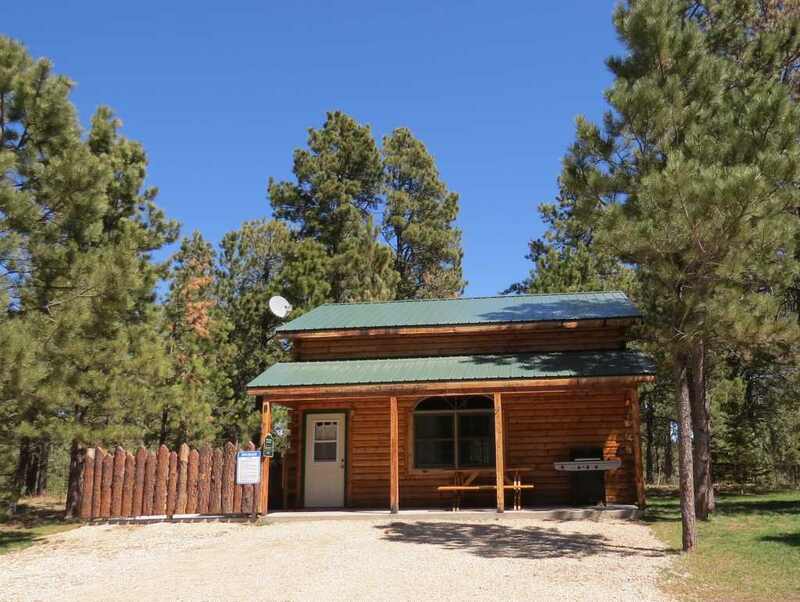 Our standard cabin is well appointed to accommodate four people comfortably but can sleep a maximum of six guests with two queen beds and a queen-size pull-out sofa sleeper all located in one cozy room together. Each cabin has a bathroom, kitchenette, dining table, heating and cooling system, and an outdoor charcoal grill, picnic table, and fire ring. Cabins 1, 2, 3, 4, 7, and 8 are part of a duplex cabin as pictured above. Each side of the cabin rents individually, but is a good option for larger groups wanting both sides of the same cabin or for guests wanting separate bedrooms. It has an adjoining wall with a door on both sides that can be opened or closed/locked. Cabins 5 and 6 are single, stand-alone cabins as pictured above. 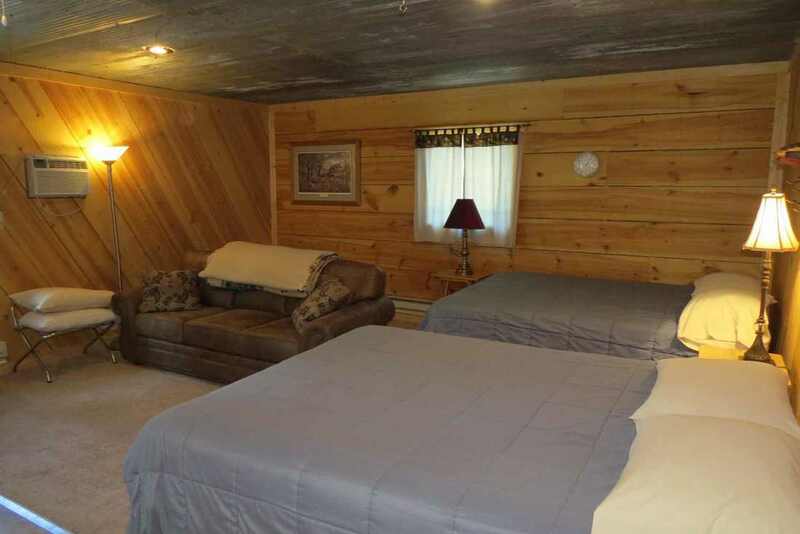 They have the same layout and sleeping arrangements as the other cabins. 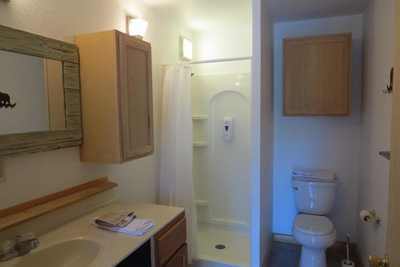 Cabin 6 is considered handicap accessible and has a larger shower stall. To see the layout of the property, please see our page "Plan Your Stay." Additional Guest Info: Rate is for 4 guests and additional guests are $15/person/night up to 6 maximum. A $25 non-refundable payment required at time of booking and the balance paid at check in. If cancelled at anytime, the $25 deposit serves as your cancellation fee. If cancelled five days or less prior to check in, charged for the full cost of the stay unless we can re-book. Children under 11 years of age are free. Pets are $10 extra per pet per night. Sturgis Rally Week Info: Rate is for 4adult guests with each additional adult at $30 extra per night up to 6 maximum. Full payment required at time of booking. Subject to a $100 Cancellation Fee and non refundable 60 days prior to check in. Pets are $10 extra per pet per night. Located on the 2nd floor of our Main Lodge and offer access to large deck with patio chairs, tables, and grills. These units are located in the main lodge above the restaurant/bar. 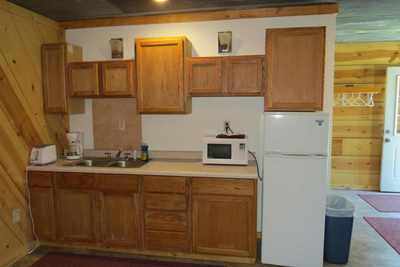 Each unit offers a full sized kitchen including standard fridge and oven/stove. It can comfortably sleep up to 8 people with four queen beds (all located in one large room together - not separate bedrooms). 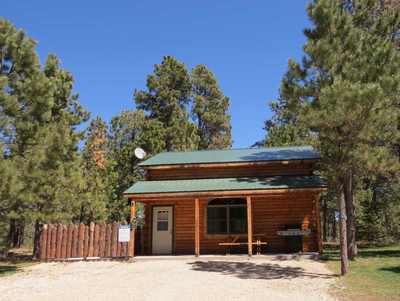 The lodge rooms offer TV with basic cable, a couch, dining table and chairs, and a bathroom. Linens and towels are provided. Cookware and utensils are provided. 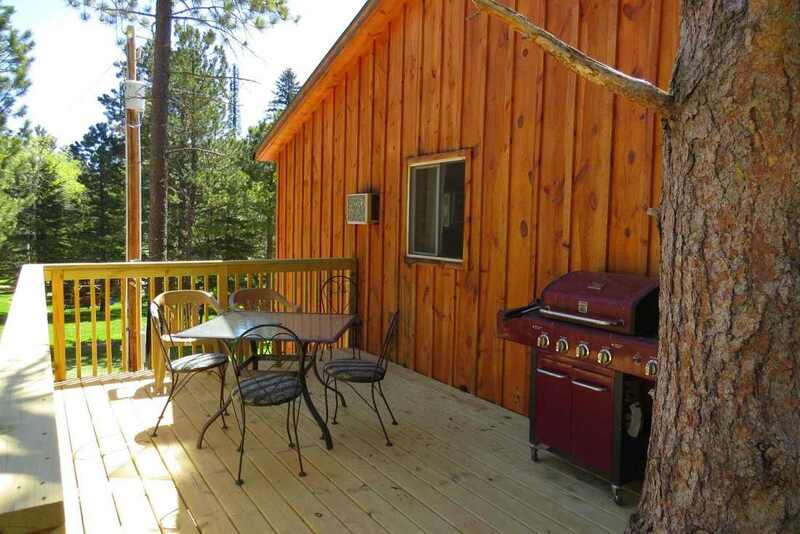 Outdoor access to large 2nd story deck with gas grill and a shared ground-level fire ring. ChilAdditional Guest Info: Rate is for 4 adult guests with each additional adult at $15 extra per night with up to 8 maximum guests allowed. A $25 non-refundable payment required at time of booking and the balance paid at check in. If cancelled at anytime, the $25 deposit serves as your cancellation fee. If cancelled five days or less prior to check in, charged for the full cost of the stay unless we can re-book. Pets are $10 extra per pet per night. Sturgis Rally Week Info: Rate is for 4 adult guests with each additional adult at $30 extra per night with up to 8 maximum guests allowed. Full payment required at time of booking. Subject to a $100 Cancellation Fee and non refundable 60 days prior to check in. Children under 11 years of age are free. Pets are $10 extra per pet per night. 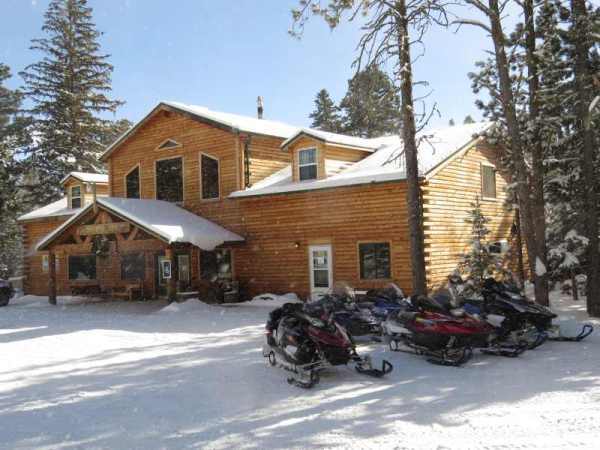 The Tree House is located on the 2nd floor above the ATV rental shop/garage on the west side of the Main Lodge. It is one room with two queen beds and a queen pull out sofa sleeper, a small kitchen, dining table, bathroom, and air conditioning. The outdoor deck features a tree growing through the center of it along with outdoor seating, and on the ground level, a charcoal grill, picnic table, and fire ring. Only available for rent during the summer. Sturgis Rally Week Info: Rate is for 4 adult guests with each additional adult at $30 extra per night up to 6 maximum. Full payment required at time of booking. Subject to a $100 Cancellation Fee and non refundable 60 days prior to check in. Pets are $10 extra per pet per night. The Salem Villa Camper features two bedrooms - one with a queen bed and the 2nd with a full size bed and a small top bunk. Kitchen with stainless steel appliances and marble counter tops, dining table, living room, bathroom, and air conditioning. Linens, towels, cookware and utensils are supplied. Large built-on deck with seating, gas grill, fire ring, and picnic table. 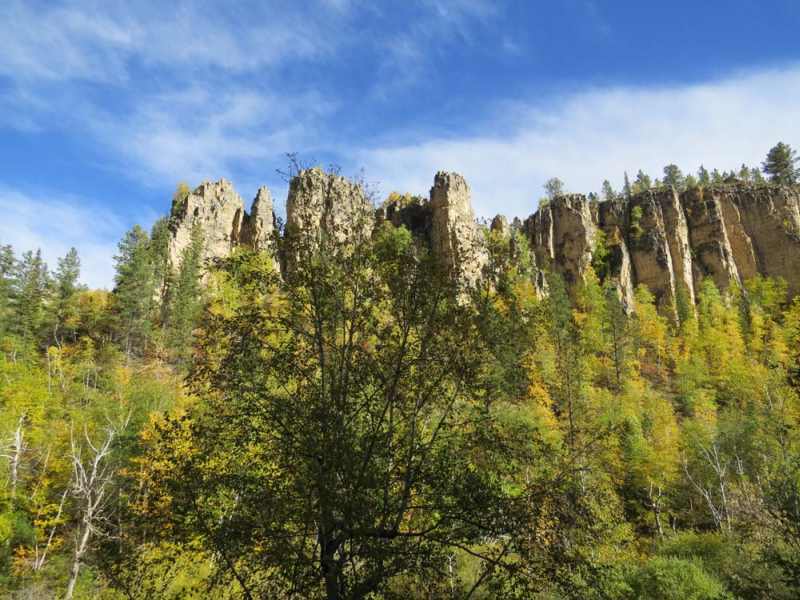 Enjoy your stay in the Black Hills in our Rockwood Camper. 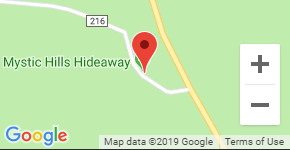 It's located on a tree covered full hook up spot with a picnic area, fire ring, and picnic table. The camper has a queen size bed, twin bed, and full size bed. 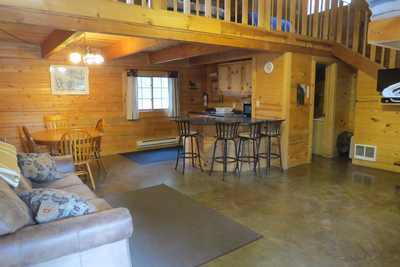 It also includes a full kitchen, dining table, sofa, and a bathroom and has air conditioning. Linens, towels, cookware and utensils provided. Grill, picnic table, and fire ring. Available for rent only during the summer season May-Sept.